Cerambot announced the launch of the first affordable desktop ceramic 3D printing solution for hobbyists, consumers and professionals alike. Their revolutionary design can be added as a module to the most popular 3D FDM printers or can operate as a standalone, full printer kit. Recent advances in 3D printing technology and widespread adoption of ceramics products for art, industry and hardware has created demand for this exciting new approach to an age-old material. At the nexus of this new trend, low-cost ceramic 3D printers are making it easy for anyone to dream, design and create. Ceramic materials are organic and have special properties that make them the ideal basis for many end products. The material is food-safe, biodegradable, heat resistant, mechanically strong and environmentally friendly. Ceramics now offer a more user-friendly and safe alternative to 3D printing with common polymers and plastics. After years in the industry, the team at Cerambot applied their experience to create a revolutionary new design that lowers the cost and adds simplicity to ceramic 3D printing. Their design uses a clever new extruder with a patented, customized worm gear motor with speed reducer that guarantees outstanding printing quality and stability for more complex prints. It also eliminates air bubbles in the mixture, eliminating the need for the expensive and noisy air compressors that are found on first-generation ceramic printers. This new design makes the device compact, inexpensive, and more user-friendly than previous printers and keeps the cost affordable for anyone, including home users. 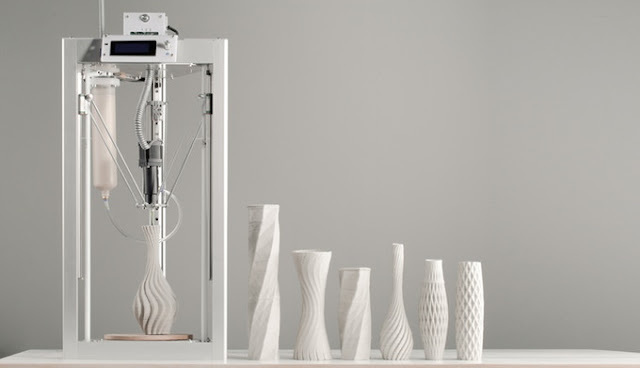 Although low-cost, the Cerambot 3D printer is capable of great accuracy and highly complex prints. The system is fast and accurate and achieves mechanical printing precision to 0.1mm and a print resolution of 100 microns making it perfect for arts and crafts as well as prototyping and production. The system is easy to use and works with common open-source software such as Slic3r and Cura.